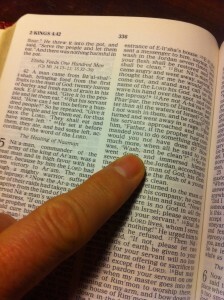 In Luke’s Gospel (4:27) Jesus mentioned Naaman once. Jesus used the old warrior from Syria as an example of how God and God’s prophets go about their business. Jesus so thrilled his listeners (a.k.a., his friends and neighbors), they attempted to toss him off a nearby cliff. Irked the sermon’s message, they wanted to see how far the messenger could spiral down before smacking the ground. However Jesus “passed through the midst of them, and went on his way.” In other words, Jesus escaped a lynch mob. Though the name Naaman surfaces several times in the Bible, I’m interested in the fellow that starred in the fifth chapter of Second Kings. Outside of Kings and Luke, this particular Naaman is no more than a footnote. As with many Biblical characters, he appears and then vanishes. But while “on stage,” he makes an impact (and I don’t mean like a body falling off a cliff.) Naaman, a “commander of the army of the King of Aram” (Syria for modern Googlers), is by all accounts a warrior, feared and fearsome. In other words, one tough dude. With one issue: skin tissue. He’s got leprosy; can’t hide his bad hide. In the wondrous ways of the Bible, where happenstance and Holy desires hold hands, Naaman learns of a cure: Go see Elisha, a prophet of the God of Israel. I’ll trust that you, dear reader, have already read the full account in II Kings. However, let’s make it interesting . . .
What’d you choose on your quiz? I picked #3 every time because, regardless of Naaman’s lack or abundance of Biblical detail, when I read about him . . . I see me. Yes, I have a bicycle. Darn that iPhone, I should charge it. And my lovely wife cringes when I wear those tattered denims in public. Naaman, like me, and like you, needs a cure. Whether the disease of skin, soul or mind, we all journey to seek healing. We aren’t who we want to be; we aren’t, God knows, who we can be. Heal me. Help me. Make me whole. For Naaman, through Elisha’s words, God makes the cure darn easy. This is where the warrior gets peeved. He doubts easy. He questions easy. He’s instructed to bathe seven times in the Jordan and, perhaps equally petulant and incredulous, scoffs at the suggestion. Why is hard sometimes more compelling than easy? Where's that simple, "magical" answer? The hardest professional decision I ever made came when my bishop asked me to leave my position as a hospice chaplain to become the senior pastor of a church in turmoil. I made the hard decision harder. I delayed answering. I spent time with Hem and Haw. I prayed. I talked with friends. Once, anguished over saying “yes” or “no,” I did what is always a foolish, childish thing: I randomly opened my Bible and plunged my finger onto a passage. Any passage! And what would this magic verse reveal as God’s will for me? Finally, unsure (and with my finger slightly bruised), I agreed to serve the church. What was right? What was wrong? This I know, looking back . . . I made a hard decision harder. How much did I trust God, and distrust myself? But decisions can be easy. Months before the Bishop’s request, I’d offended a fellow chaplain. In my eagerness to please—and, truth be told, also selfishly trying to appear like the guy-who-could-do-it-all—I handled a phone message for another chaplain. The call came from one of her (the other chaplain’s) patients. 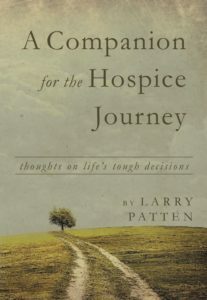 Instead of merely taking a message, I “ministered” to the patient, made promises of what I (and the hospice) would do. I overstepped my boundaries. I upset another person’s pastoral care. While my skin might’ve been unblemished, like Naaman, I was dis-eased. How could I find healing, wholeness? Simple. I needed to face my colleague and say three words: I. Am. Sorry. No hemming or hawing or finger-plunging necessary. Simple, and yet so very, very, very, very, very, very, very hard. Seven times in the Jordan, Elisha told Naaman. Easy-schmeasy. It is. It isn’t. Sometimes the simplest thing confronts our worst fears. Do we have the courage to wade into water? What if it works? What if it doesn’t work? Do we have the courage to speak three words? Naaman departs the Bible faster than riding a chariot (or bike) through a town with one stoplight. But, for me, he lingers, a reminder that the path to wholeness is easy. Often, the only stumbling block is me. Sara – Moves can be awful . . . even the best ones. I also wrote you an email. You are within my prayers. I vividly remember the week I was preparing, as a teacher, for a class on Chapter 4 of Luke, for a year-long class on Luke-Acts. I was flummuxed by the congregation’s reaction to Jesus, after his sermon started out so smoothly. Why in the world did they end by turning into a lynch mob. This was about four years ago, before I had lots of book learning from the professors at the Moravian Theological Seminary. I was “winging it”, largely on the basis of having the time to do it (I was retired), the interest, and an ability to research. But somehow, none of my commentaries seemed to get to the heart of the reason. I don’t recall if it dawned on me by my own native wit, or if I finally came across someone who explained it effectively. All of you are probably snickering because you have known the answer for years. Well, I never said I was “fast”. Of course, the problem is that Naaman was a Syrian, and Elisha was helping a “foreigner”. Combine that with the story before, where Elijah helped a foreign woman in a famine, and it was like preaching tolerance for a bi-racial couple at a KKK Konvention….and just this moment, telling how rich the Bible can be at times, I realized this pericope was a perfect example of the kind of “generation of vipers” thinking Jesus was up against.